Dr. Abiola Dele-Michael is a leading cardiovascular disease expert located in Manhattan, providing top-quality care for patients with congestive heart failure, coronary artery disease, valve disease, arrhythmias, peripheral vascular disease and other cardiovascular-related health problems. As a recognized expert in his field and a specialist in advanced echocardiography, nuclear cardiology, and vascular ultrasound, Dr. Dele-Michael offers the most advanced, most effective and safest interventional and treatment techniques combined with knowledge and guidance to help patients improve their cardiovascular health and enjoy optimal wellness. His compassionate approach to care has earned him praise from patients with all types of cardiovascular issues. Born and raised in New York City, Dr. Dele-Michael received his bachelor of science degree from Cornell University and his M.D. from the University of Rochester, where he graduated with distinction. After completing his residency in internal medicine at the University of Michigan, Dr. Dele-Michael joined the university's medical school as a faculty member. Afterward, he completed a fellowship in cardiovascular disease at New York Presbyterian Hospital/Weill Cornell Medical College where he specialized in noninvasive advanced cardiovascular imaging techniques including nuclear cardiology, cardiac magnetic resonance imaging (MRI), and 3D echocardiography. 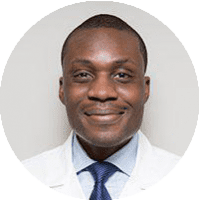 Before opening his practice, Dr. Dele-Michael was an assistant professor of medicine at Weill Cornell Medical College, developing expertise in the diagnosis and management of complex cardiovascular issues, including diseases affecting the valves and structure of the heart. He holds multiple board certifications in internal medicine and cardiology. Dr. Dele-Michael is committed to providing the highest quality care and helping patients understand their condition and their options so they can feel confident in their care and their health. Visit us at our other locations! Dr. Dele-Michael has three convenient locations throughout the city! Please call to schedule an appointment at either of our other locations! High yield evaluation. Low hassle. Positive cardiovascular outcomes. We are a full-service cardiovascular medicine practice, located in New York City, utilizing state-of-the-art technology in the prevention, diagnosis, and treatment of cardiovascular diseases. Our board-certified Cardiologist, Dr. Abiola Dele-Michael, offers expert recommendations and guidance for all your cardiovascular concerns. We are committed to patient education because we know that an informed and engaged patient will make healthy choices which will produce successful cardiovascular outcomes.